Let's get comfy today. 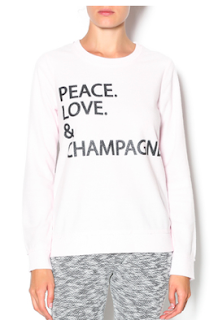 Let's pull on a soft sweatshirt that says just how we're feeling. 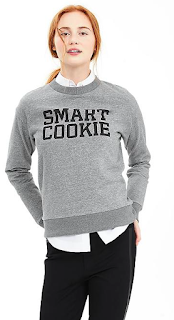 Sure, we can wear this sweatshirt with leggings and slippers, but these sweatshirts, these are #OOTD worthy. Let's layer to dress up these fun sweatshirts. BR has the right idea. take a preppy sweatshirt and pair it with a peter pan collar button down. I'm pairing this with black jeans and statement earrings. And then getting some bubbles. Wildfox has a ton of fun sweatshirts, but this one spoke to me. 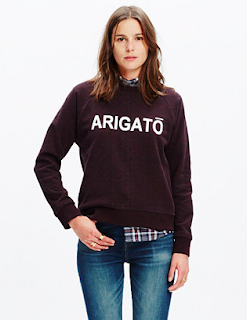 Why thank you Madewell, this sweatshirt is so fall. I'm copying this look with a plaid button down and bf jeans. Sweatshirts aren't just for lazy Sundays. These pieces offer comfort and style they're surprisingly versatile!